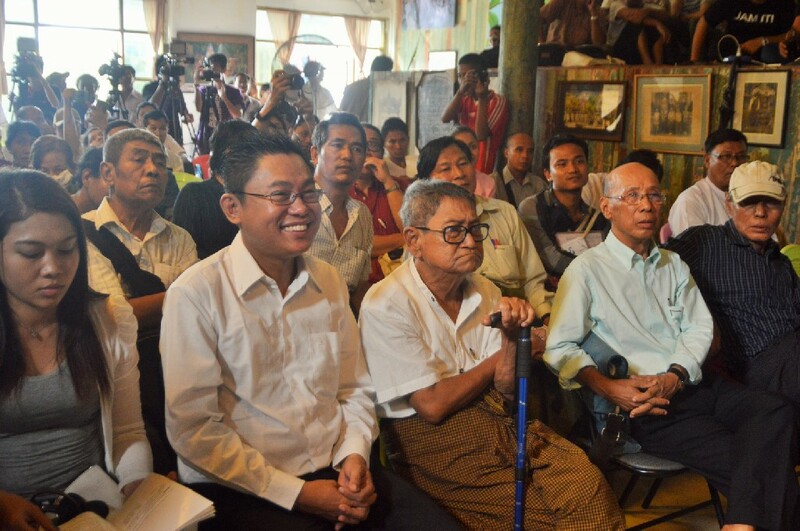 ‘Eain Aye Kyaw does not paint by theory. He paints freely as he desires, influenced by the tempest of his emotions, not thinking of how his work might be analysed,’ states the long cover story article published in one of the Pansodan Journals of October 2013, a little more than a year ago. ‘When I come across pieces made by my favourite artists, I look at them until I get my fill. I like them so much. If I am painting something, I stay away from other people’s pictures; I am afraid of my own style disappearing’, said Eain Aye Kyaw at that time. The young artist who graduated at the beginning of the millennium from the State School of Fine Art had his first solo show at Lokanat Galleries in 2005. 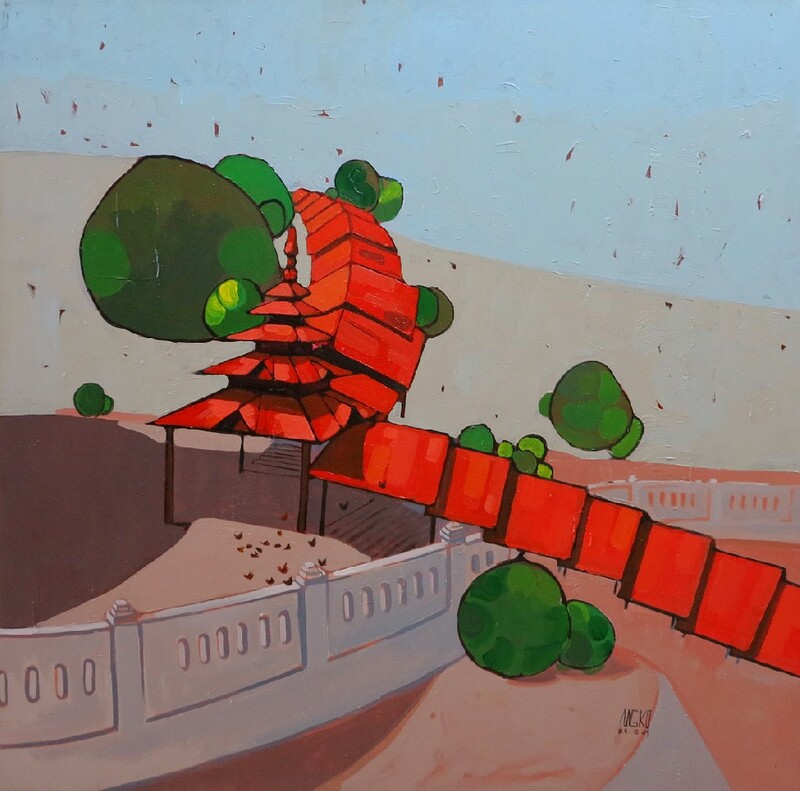 Eain Aye Kyaw joined Pansodan’s Team in 2009, his second solo exhibition was held at there in 2011. ‘He came to the Gallery to show his works to me. 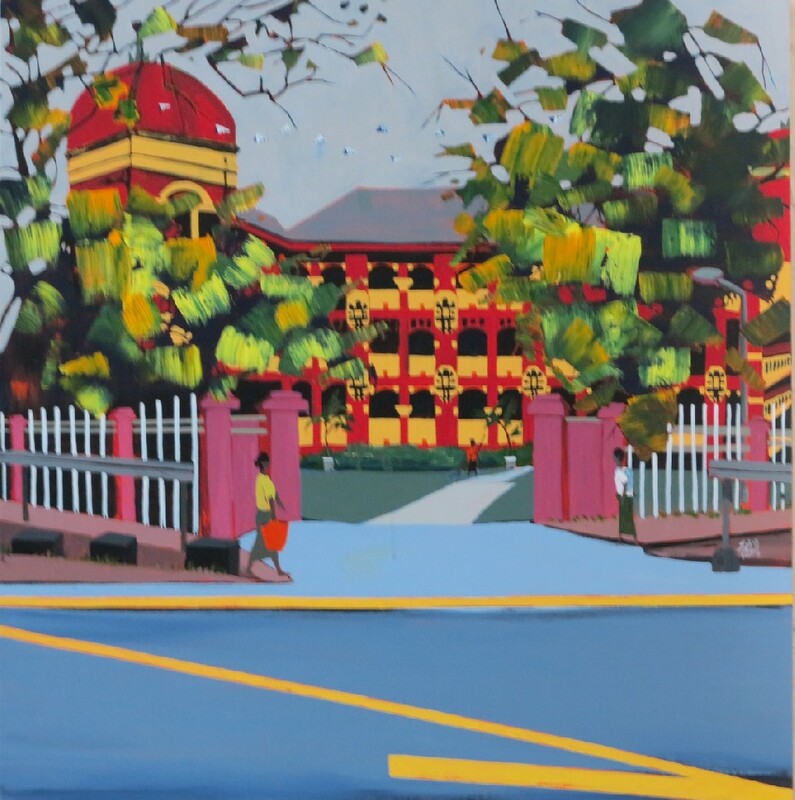 I recognized his talent at first sight, his use of intensive colours to shade and nuance his compositions created a fascinating contrast,’ remembers Aung Soe Min, owner of Pansodan Gallery. Eain Aye Kyaw passed away at the age of 33, suddenly, unexpectedly on November 12, 2014. The attention around his work was strongly growing these days, he was looking ahead a promising future. 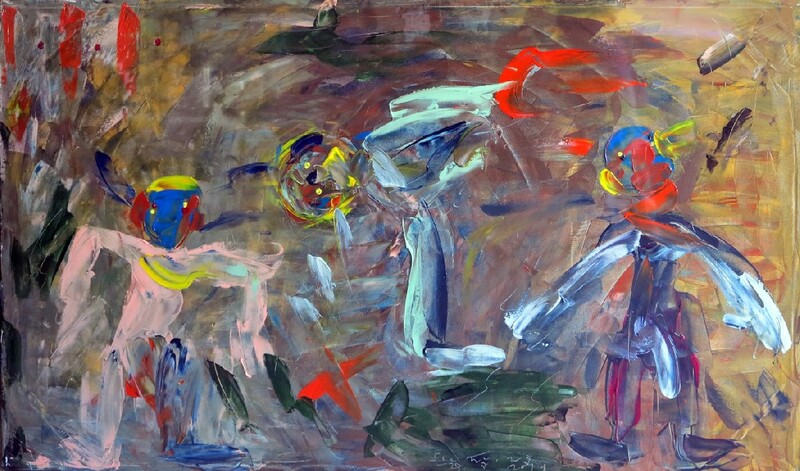 As a painter, the works he left behind, his enchanting colour and shape palette will help us remember his talent, and through them, visualize the unusual artist he was. Han Tin Swe uses a so definite visual language that it is hard not to recognize his works from far away. One of his most recent works is however quite particular as instead of opening the perspective and enable a large horizon within the composition, it shows a strongly vertical disposition of the elements. The main motive is located in the central part of the foreground. An immense well, seemingly playing a central part in the people’s life living nearby. The intense use of different shades of blue, the stylized vegetation, the shapes alluding to small clouds allows the picture a fairy atmosphere as if the spectator was witnessing a scene of a tale for children. The square painting reflects a somewhat distorted perspective, not an unusual element on Aung Ko’s works. In a simple landscape carrying rather neutral colours, an extremely long roof structure heads from the right lower part of the canvas towards the focus-point, escalating even through a white stone fence. Before taking a 9o°C turn in the direction of the background to disappear behind the horizon, the line assembles into a small square structure supporting itself a complex roof construction. Some green bushes appear here and there cooling the burning atmosphere of reds and light oranges, but it is the shade under the architectural element that promises a true rest. The quiet and calm emanating from the work surely smooths a too vibrant space! Almost 200 people tried to fit in all together in Pansodan Scene on November 20, the Day of Philosophy. The wide space on the second floor of this Pansodan Street colonial building allowed to raise questions, attempt answers and save a few hours for intense thoughts with the participation of philosophers of course and writers amongst others. Only one more year to wait for the next one! The Let’s Speak Art! Sessions continue in December! The last LSA of the year 2014 will be held on Monday 8 December 2014 from 6.30 p.m. at Pansodan Scene. The series ‘About and Around Art’ was started in October as a new regular program offering the possibility of friendly gatherings to talk about art theory and techniques. The idea, conceived by Borbála Kálmán, a Hungarian art historian living in Yangon since early 2014, is to provide regular sessions where artists, art lovers, actors of the art scene can share ideas around a specific topic for each session. The ‘art history club’ would like to focus on issues around the contemporary art scene but also provide some background information on earlier art tendencies. Hence, the talks would help discover the different cultural contexts which have brought to life such movements as Surrealism, Cubism or given birth to the first conscious Abstract art works. For each occasion, an interesting visual material is projected to illustrate the topics. The ‘Let’s Speak Art’ sessions is organized in association with Myannmar Art Resource Centre and Archive (MARCA), a young project dedicated to collect and digitize documents and books from the Asian art scene with a particular focus on Myanmar. For each ‘Let’s Speak Art!’ session, some books related to the current topic are chosen and brought along for the audience to discover them at Pansodan Scene. 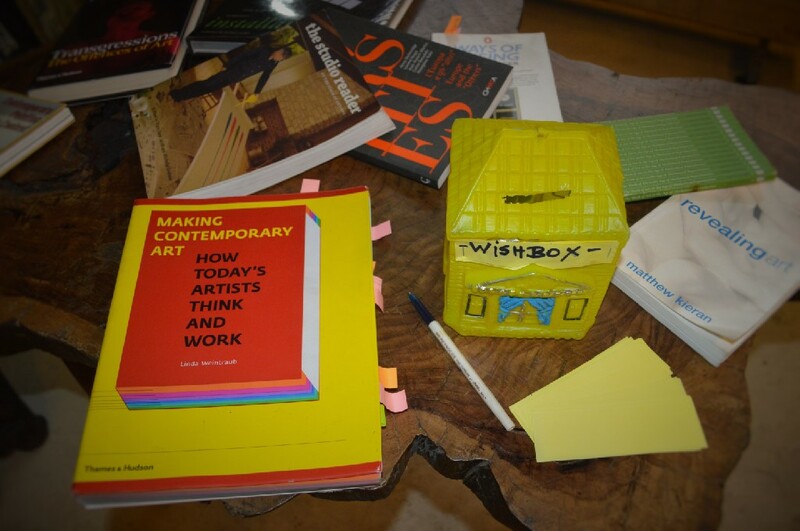 During each event, questions placed in the ‘wishbox’ are answered. So don’t forget to bring a pen to write down yours! Free entrance. A fascinating initiative will bring at the beginning of December 30 unique works of art by 12 Myanmar contemporary artists to Miami, USA. 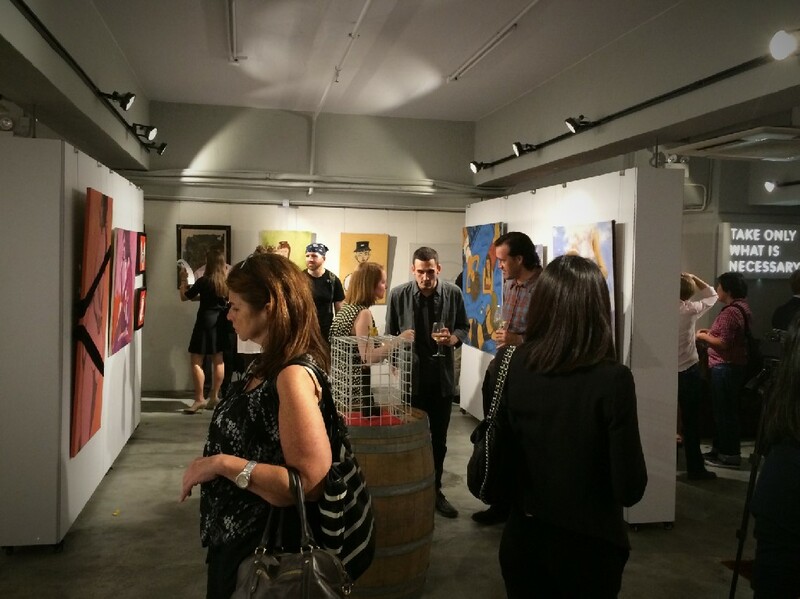 The pieces, carefully curated by Mr Ahal Besorai from Fore Front Capital with the help of Aung Soe Min, owner of Pansodan Gallery for most of the works, will be exhibited for three days during Art Basel, one of the most important international art fairs held annually at Miami Beach. Collectors at Art Basel will have hence access to the works of contemporary Myanmar artists closed for so long within their borders. The selection will be also featured exclusively at a special invitation-only show at 1545 Collins Avenue, Miami on Thursday, Dec. 4, co-sponsored by Pall Mall, Forefront Myanmar and Quintessentially Lifestyle, a global concierge company. “I feel this is a unique opportunity for Myanmar art and the chosen Myanmar artists to be able to exhibit their works on the international stage,” says Mr Besorai, having initiated the project. “My aim is to create a global platform through which Myanmar art and artists can get as wider as possible exposure to the leading art markets”. 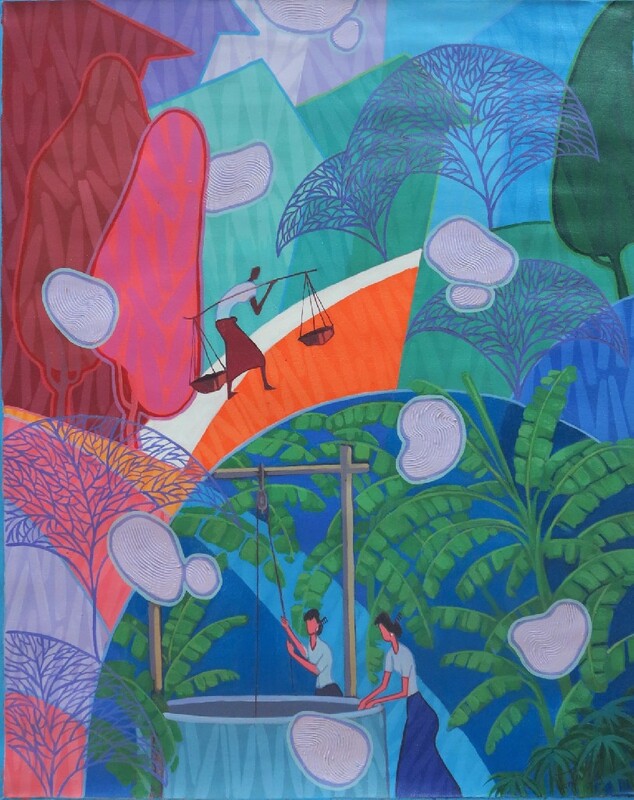 “As someone who has been involved in the local Myanmar art scene (both as an artist and as a gallery owner) for over 20 years, it is refreshing to see that finally Myanmar art is managing to make a serious international impact,” adds Aung Soe Min, “it gives me great pleasure as one who has accompanied most of these artists from the early stages and one who witnessed them grow and develop to now be able to assist with and be a part of this exciting global push,” he continues. The exhibited artists from Pansodan Gallery will be Soe Naing, Ei Kaza Cho, Zaw Nyunt Pe, Zwe Yan Naing, Myint San Myint, Aung Htoo, Fela. Several artists of Pansodan Gallery have been selected to participate to an important and unusual exhibition titled Banned in Burma: Painting Under Censorship. The show embracing more than 50 works, co-curated by Melissa Carlson, Ian Holliday in partnership with Ko Pyay Way (Nawaday Tharlar Gallery) and in consultation with Aung Soe Min (Pansodan Gallery) ‘highlights paintings produced under the military government from 1962 to 2011 and in the aftermath of the March 2011 transition to civilian rule’ (press release). The exhibition ‘affords viewers a sense of the challenges faced by artists who experimented with non-traditional art forms and the unique vocabulary developed by artists to evade censorship,’ adds Melissa Carlson. The show will be soon presented in Hong Kong between November 29 and December 1, 2014 at the Hong Kong Visual Arts Centre.